This is a class firmly rooted in journalism. Students will learn to research, report, shoot, and edit short, focused video stories designed specifically for the web. This class will build on the basic video concepts and skills taught in first semester interactive and video craft classes — using video cameras and editing in Adobe Premiere Pro, shooting, transcribing and editing video for compelling visual journalism, telling successful stories through strong characters, and basic interview skills — and move on to more advanced techniques in these areas. Because web viewers demand highly engaging material, with a fast start, sharp focus, short narrative, and natural voices, students will focus on capturing stories with strong visuals and ambient audio of people personally affected by issues. We will focus on the concept of subjects telling their stories in their own voices, without heavy narration and without a reporter on camera. Students will work in pairs at the beginning, but work solo by the end, to prepare them for the major shift in journalism requiring one journalist to be highly skilled in many jobs. They will also learn how to market freelance pieces to meet the growing demand for professional-quality video for a growing number of websites. We’ll be using Canon c100 cameras to shoot HD video. Industry standards and favorites change, but let’s be honest, no one cares which camera you use, it’s the quality of your work and the strength of your visual storytelling that really matters. Instruct and supervise fellow journalists in choosing stories that can become effective video stories and guide them in the production of those stories for the web. Things you’ll need to turn in, almost every week. Do not be deceived into thinking that short visual journalism is easy. Think of how difficult it is to write a brilliant headline, the ideal tweet, or condense a 90-minute documentary perfectly into 2 minutes. Simple is hard. It takes time and effort to make it good. That’s our goal. Each assignment will consist of a short video (2-3 minutes) suitable for web publishing. How long should the videos be? As long as they should be. A video is the right length when it feels complete and holds interest all the way through. In general videos have ranged from 2-4 minutes. Anything over needs to be really engaging. The assignments will be graded. This is a class that values good research, smart reporting and story development. Visual storytelling is also key in the form of capturing compelling scenes and sequences and “visual evidence” of your story. We want to capture “present tense” storytelling, ideally with an unfolding action. One of your stories must have more than one character, or at least more than one interview subject. Late assignments: videos that have not been uploaded to Acclaim by the start of the class session they’re due will be automatically lowered a grade. REVISIONS: Once you receive your grade and critique, you will have two weeks to revise your project based on the feedback. This is a team project. Students will work in pairs. Some of these would qualify. Maybe these jobs would also work. Oh yes, the New Yorker Magazine even writes about some of these; the NYTimes too. Each team will share all their material and each person must edit and submit their own original version of the story. One of these projects must be done only with visual storytelling and with an “active” interview, that is, without a sit down, NO formal interview. Here is an example of a pilot for a video series from the NYT, also a sceience/business series from the NYT: Robotica, (sponsored by Intel); next a wonderful everyday series from the SanFrancisco Chronicle: The Regulars and finally, if you love to travel and want a hit-and-run in 36 hours, enjoy this travel series (sponsored by Google). This is a solo project, though you can have a second shooter. One of these projects must be done only with visual storytelling and with an “active” interview, that is, without a sit down, NO formal interview. One of your two projects must also use some other form of visuals, like still photography or animation, etc. Exercises will constitute 20 percent of your final grade. Points will be subtracted for lateness. Each exercise will be done solo. Upload your exercises to Acclaim. Be sure to title them with your name in the beginning of the title. Important elements: shots that tell a story, sequencing, good clean composition, focus, exposure, proper white balance, use of ambient audio. Edit for pacing and rhythm. Here’s one that Bob Sacha shot. Capture a scene where something unfolds in front of the camera. Build the scene as something that might open your story or transition us from one part of the story to another. There is no use of interview or characters addressing the camera. We should feel like flies on the wall, experiencing something that piques our interest, either by making us want to know what happens next, or by giving us insight into a character or characters. Important elements are that something happens and that it is edited to capture a moment. This interview should be a potential subject for ASSIGNMENT 1. The subject must be shot with at least two different light sources (one must be an artificial light that you bring). Take a photo of the setup and turn that in. The interview must use three different framings (closeup, MS, WS). You can (and probably should) keep it simple. Turn in less than two minutes. Important elements are two different types of lighting, three different framing compositions and clean audio. Your edit should have at least three clips put together. This trailer/short social video would be uploaded to various social media sites to promote your second assignment. A social media piece should be between 30 and 60 seconds and involve graphics or text (since Facebook autoplays video without sound). Why would anyone ever click on this thing is the most important element. You will also create the content for a social media post to engage people with your story. You can create a short behind-the-scenes story about how you found the character, something interesting that happened that’s not in the final piece, why you created this story, etc . You could also make a gif. Try to engage your audience. We will have three “film festivals ” where you will post a link to someone else’s online video that you find inspiring or compelling or instructive. Your participation is required in both posting films and voting in each film festival. Everyone must submit a film, an inspiring short doc video you find on the internet. Submission should not be longer than 8 minutes. Crazy clever is encouraged. We’re open to compelling work, but non-fiction is strongly preferred. You will post the URL of your submission for the film festival to the correct channel in Slack. Remember to choose the correct Film Festival number. Everyone must watch the videos and cast their vote for the strongest submission the day before class. You must submit your link to the correct Film Festival channel in SLACK one week before class. You must vote HERE by Wednesday at noon before class. This is graduate school so we assume all of you are adults and we will strive to help you succeed in whatever way we can. Please complete this feedback form after every class. We have coaches available with a huge wealth of video expertise. Use them or we’ll lose them! Please make an appointment. Onel Mulet (Broadcast staff), Pro Tools audio editing/mixing, Premiere Pro video editing DaVinci color correction, field and studio audio recording and mixing, Reaper, Adobe Audition, and Digital Photography – Room 334. Office Hours by appointment. Email: onel.mulet@journalism.cuny.edu. You will need your own portable hardrive that is at least 1TB, 7200 rpm and USB 3.0. You should have an identical drive as a clones backup. You will also need your own digital media card for the cameras. A 32GB sdxc high speed card is a good start, though I usually use a 64GB one. Be sure the speed of the card is at least Class 10, like this one. We have a limited number of Canon C100 Cameras. This is very much like the real world so you must reserve at least 25 hours in advance and supplies are first-come, first-served so please plan accordingly. Here are some excellent tutorials on setting up the camera for shooting Part One and Part Two, shooting with the c100, using the waveform monitor & gamma for good exposure, and video assist features. A+ 98 – 100 A future Online Journalism Award winner perhaps? A 92 – 97 Publishable quality, with minor edits or questions. A- 89 – 91 Nearly publishable, with just a few minor issues. 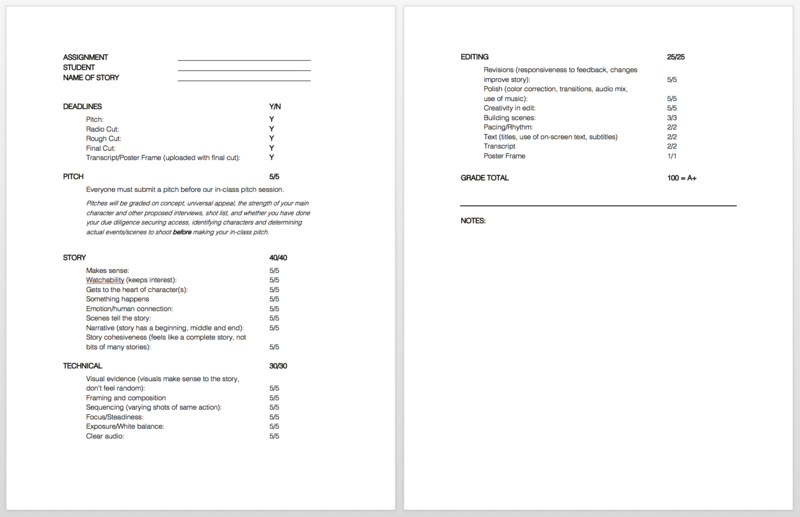 B+ 86 – 88 Better than just good … with more work, it could possibly be published. B 81 – 85 Good, solid work with several minor issues or a single major problem. B- 78 – 80 Decent work with several bigger issues. 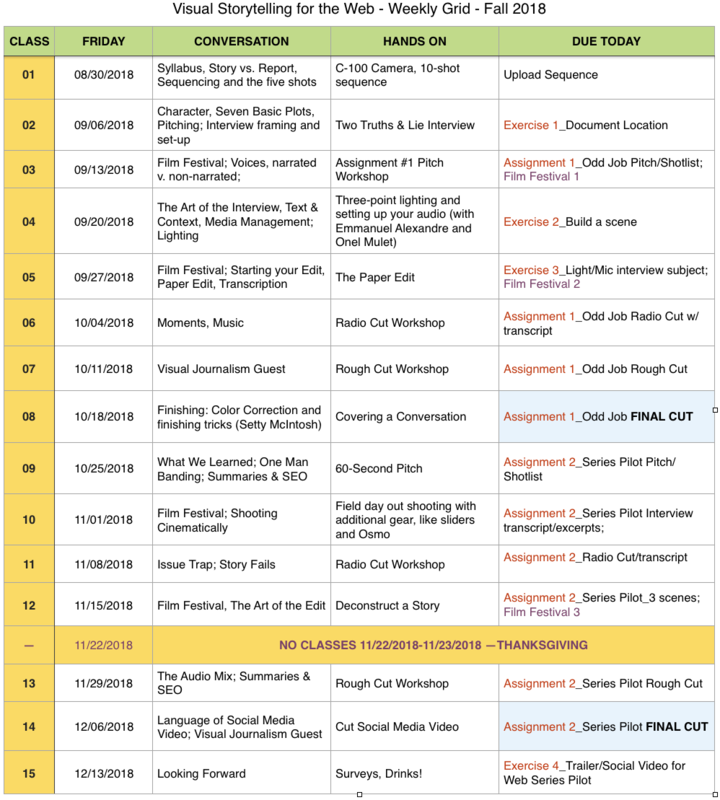 Revisions: You’ll have two weeks from the day you receive the final cut feedback to revise your final cut. Your final assignment grade will be the average grade of the final cut and the revised cut. If you miss the final cut deadline, you will also forfeit your chance to revise. In the fast paced world of online journalism, deadlines seem to come constantly and repeatedly. They are also very serious business (check the first citation in Merriam Webster). So please regard them with awe and don’t even think of missing them. If you are late on a deadline, even by a minute, your grade will automatically be lowered by a half grade. Your grade will drop a half grade for every day you are late. Plan ahead. It almost always takes more time than you think to complete these assignments, so please don’t leave this to the last minute. If you’re encountering difficulties reaching a source or finding information or shooting or editing come see me or contact me via a direct message on SLACK at least 48 hours before the deadline. I can help guide you. I want you to succeed, but I will not tolerate last-minute excuses. Attendance is mandatory and unexcused absences will be reflected in your final grade. Job interviews, work obligations, computer problems, routine medical appointments, meetings with advisers, transportation issues, and even scheduled source interviews are not valid reasons for missing class. These excuses, err, reasons will be considered an unexcused absence. Only a severe personal illness or family emergencies are valid reasons for missing a class — and you’ll need to provide a written excuse and documentation before I’ll consider them. I will only consider a written excuse from a doctor in the NYC area that you have visited personally. If you’re not in class, in your seat and present 10 minutes after we begin, it will be recorded as an absence/missed class. If you miss two classes without a written excuse or documentation, you will drop a full grade. If you miss three classes, you will fail this class. I will hold you to the same standard as your editor at the New York Times: that is, missing class for a wedding or because you feel crummy is not excusable in the real world and it won’t work in class either. You might not value your grade in this class, but I talk with a lot of editors and commissioning editors. I promise that if they ask about you and you’ve been late or missed class, I’ll be totally honest with them. Please be on time. A sign-in sheet will be passed around when class begins. If you have not signed in, I will assume it was because you were not in class and you will be marked absent. Please don’t take phone calls during class. It’s insulting and will not be tolerated. Also, I suggest you don’t post to Facebook or Twitter or answer your email during class because those will be the first things I remember when you ask me for a job recommendation or when your employer asks me about your work habits. Please consider how you might include topics of diversity in your reporting and visual storytelling. Consider covering diverse and especially under-reported communities. Strive to show them in their “ordinariness” by including them in stories other than those about race, class, gender, sexuality and social pathology. Look for stories that are out of the mainstream press, particularly those about African Americans, Asians, Latinos, Native Americans, white women, the LGBT community, and underpriveleged people of all races. Use them as meaningful sources, as your “experts.” Your sources live the life, not someone who is sitting in an office with books behind them and an academic title on their desk. Use those people in the office, the usual suspects of “experts” as research, not as voices in your video. Strive to tell stories that are free of euphemisms and stereotypes and that portray your subjects in a non-stereotypical fashion. All work in this class must be your own. Plagiarism is the use of another’s ideas or words, video or recordings or ideas without properly and clearly acknowledging the source of the information. Using other people’s work, video, audio, music, text or ideas without attribution and their written permission will result in an F for the assignment or potential dismissal from the course depending on the severity of the infraction. Fabrication of information, quotes or sources. Impeding the work of others. If you are still unsure whether you’re about to cross over to the dark side, PLEASE COME SEE US. Again, we want you to succeed and academic dishonesty is the worst kind of failure. Also, there are no questions that are too obvious, too simple, too stupid. If you have a question, there’s a good chance your classmates have the same question. No one is ever penalized for asking any question.